Item shown above : Solid wood in Black Finish with Mini liquor bottles in display. (Mini liquor bottles NOT INCLUDED). 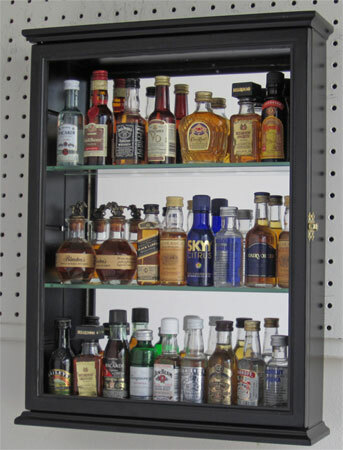 Gorgeous gallery quality display cases for Mini Liquor Bottom collection. Removable glass shelves. This would be a excellent gift for collectors. Made from hand selected fine quality hardwood by our experienced craftsmen. Surface is sanded repeatedly to make it smooth and elegant. Mirrored Background to create a lovely display. Brass hinges and door latches. Wall brackets to hang (wall mounted). Hinged Glass door cover to protect from dust and damage. The inside holds 30 helmets. You can put some on top of the display case. Space between rows: 2.5" with all shelves in. If you remove some shelves to have only 3 rows display, then you would get 5" shelf height.